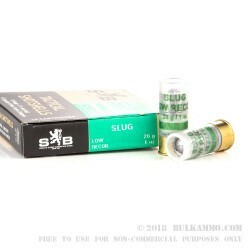 This slug ammunition from Sellier & Bellot uses a low power powder charge designed to keep recoil manageable and reduce the risk of overpenetration. Each 2-1/2" shell in this case of 250 fires a one ounce slug at a muzzle velocity of 1,050 feet per second. The compact form factor of these shells enables the storage of an extra shell in some shotguns. Note that some shotguns (most notably from Winchester) are not designed to operate safely with "mini shells" like these! Check before ordering if you're unsure whether your firearm supports mini-shells. These 12 gauge shells are manufactured in the Czech Republic, where Sellier & Bellot has operated since the 1820s. Just what I was looking for? 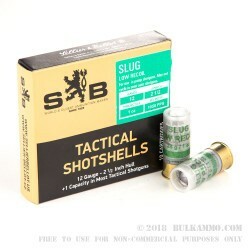 Inexpensive bulk ammo why no problems. I took these out to the range today and fired off 50 rounds. DISCLAIMER: This ammunition box explicitly says these rounds may not cycle in semi-automatic shotguns. This is something Bulk Ammo doesn’t say and you can only see if you zoom in on the pictures. I own a Linberta 12 gauge semi-automatic tactical shotgun (2.75-3” chamber). I bought the ammo without knowing the problem with semi-autos. At the range I had around 5 FTFs out of 50 shells. They occasionally failed to open the chamber or else got caught when ejecting. The shells were just as accurate as more expensive rounds. They had very little recoil. I was shooting 20 gauge slugs at the same time and these slugs probably had less recoil than those. An excellent value but not 100% reliable when using them with semi-automatics. THEY WILL WORK. Just not all the time. Great for the range but not probably something you want for sell defense. I’m happy with the purchase. 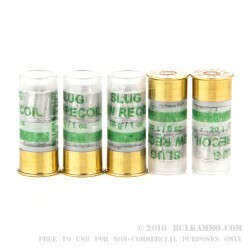 These slugs are consistent, reliable and inexpensive. The reduced recoil means you can fire all day long without your shoulder complaining. After zeroing in at 50 yds. there is a 4-5" drop at 100 yds.